It’s officially Christmas time and I’m in a decorating mood and what better than to create something for my home? If you follow Instagram, you'll know there are quite a few challenges ongoing at any given month. My daughter asked if I would do a MerMay challenge with her this May. "Bring it on", I said and I have been art journaling the month long. I hope you're having fun as the Collaboration between the Relics and Artifacts Ambassadors and the Design Team from RubberMoon combine their artistc flair to bring you unique takes on both companies. I hope you are all enjoying our month collaboration with Canvas Corp Brands. When I received my package I did a very happy dance. You may not know this, but I love to draw and getting a whole notebook with blank pages is like Christmas for me and with a super size too!!! So, inspired by summer, the beach, and sunsets here's my piece! I wanted you all to see how gorgeous the High Impact Paint, Glimmer Glaze, and Glimmer Mist work with the Relics & Artifacts. And what's more summery than sea shells, right? The Coquille set works on mixed media projects, jewelry and even scrapbook layouts. Milagros has prepared a Snapguide tutorial so you can create your own beach inspired journal of your own. Don't forget we are having a giveaway at the end of the month. Here's the information. A reliquary, also a shrine, is a container for relics. It may include bones, pieces of clothing. It is important for Buddhists, Christians, Hindus and many other religions. While frequently taking the form of caskets, they range in size from simple pendants or rings to very elaborate ossuaries. Since the relics themselves were considered "more valuable than precious stones and more to be esteemed than gold," it was only appropriate that they be enshrined in containers crafted of or covered with gold, silver, gems, and enamel. Ivory was widely used in the Middle Ages for reliquaries; its pure white color an indication of the holy status of its contents. Our Lady of Guadalupe (Nuestra Señora de Guadalupe), also known as the Virgin of Guadalupe ( Virgen de Guadalupe), is a Roman Catholic title of the Blessed Virgin Mary associated with a venerated image enshrined within the Minor Basilicia of Our Lady of Guadalope in Mexico City. The basilica is the most visited Catholic pilgrimage site in the world, and the world's third most-visited sacred site. Pope Leo XIII granted the venerated image a Canonical Coronation on 12 October 1895. I visited the Basilica and it is such a spiritual place. Here's my homage to the Virgen de Guadalupe. My own Secret Shrine. What an amazing week it has been here at Relics & Artifacts®. This week, we had the opportunity to collaborate with another company and show the world just how versatile not only Relics & Artifacts® craft blanks are but how equally versatile the products offered by That's Crafty! out of the United Kingdom are. We were able to work with MDF and acrylic pieces, stencils, stamps and really flex our creative muscles. We find inspiration and creativity in places we least expect it and in arenas we swore we'd never enter. All week long, we showcased individual works from each of the Relics & Artifacts® Ambassadors in a parade of creativity, vision, and one of a kind design, like simple everyday items which become intrinsic to our identities and personalities. We can rediscover our own spirituality or possibly be inspired by another culture's beliefs systems. With art and inspiration, there are no wall, no boundaries. Thoughtful affirmations struck chords within our hearts and caused us to take a step back and truly believe in the power within ourselves to just reach for the stars. Poetry married with mixed media breathed new life into the basic substrates laid before us. A vision and a story begin to form and our hearts are unveiled. Finally, art and the blending of items within our creative arsenal can take us on a journey through time. We can go back to times long forgotten and rediscover the timeless treasure of inspiration. You see, what this collaboration and celebration of creativity with That's Crafty! has done, is spark a new flame and opened a new realm of possibilities within our own creative selves. We were challenged and thus inspired to look at substrates we would not necessarily have thought to pair with Relics & Artifacts® and breathe new life into not only our creative souls, but our imaginations. From this collaboration came pieces we had not dared to try or ideas that were merely ideas collecting dust in our proverbial rolodex of thoughts. We hope this week has been as inspiring to all of you as it has been for us. The ladies over at That's Crafty! were a pure joy to partner with and we were honored to work with each of them. Please be sure to visit That's Crafty! today and see what Lynne Moncrieff has in store on this final day of our creativity celebration. Don't forget to visit each day's post and leave a comment to be entered in our giveaway. A winner will be drawn Monday and will receive **3** sets of Relics & Artifacts® Matte Resin Craft Blanks of their choosing. It's day 2 of our week-long shindig with the lovely ladies of That's Crafty! in the United Kingdom. All week, we are partying it up with fabulous projects featuring That's Crafty! melded seamlessly withRelics & Artifacts®. Be sure to follow along with us all week because there is a giveaway at the end of the celebration! Keep reading for details. Today, we have Milagros Rivera and does she have an awesome story to tell! Since I was little, my mom used glasses. She actually has had to wear them since her teens. I was the designated companion to help her pick her prescription frames. She always purchased an inside pair and an outside pair. And they were BIG!!!! II loved being able to help her make the decision and I secretly loved trying them. She wouldn't let me try her glasses because she was afraid the prescription would hurt my eyes, but in the store it was game time! Come of age is here and now it's my turn to need glasses and to bring my daughter with me, and I totally know she has the same fun experience because she tries dozens every time she comes with me! Back in January for Creativation, I had the pleasure of seeing Sandra again and to meet for the first time fellow Art Sisters, Monica Downing, Cat Kerr and Heather Thompson. My current choice of glasses reflect those treasured trips I with my mom to eye doctor. I enjoy them immensely and they have an effect on people I can't describe. They are a conversation piece of sorts and I have ended up talking with a lot of people because of them. So when the time came to do my collaboration piece I decided to go with this Visage piece I hadn't used and make a me of sorts on the That's Crafty substrate! Besides giving you a closer look to my textures (I made you a Snapguide) I will give you a closer look at all the people that wore them while in Phoenix! Gorgeous Sandra Evertson sporting the look! Switcheroo between Monica and me! Yes Cat wore them too! Yes! Dyan Reaveley was also wanting to try them too! Turns out we have the exact same prescription! As you can see we had a lot of fun, and I thought my post had to reflect that equally! Who knows? Maybe you'll get to meet me and rock my glasses as well! Enjoy the next post over That's Crafty! Now for the giveaway details! Be sure to follow our celebration of all things Relics & Artifacts® and That's Crafty! all week. Visit the Muse for inspiration, leave some love along the way, and be entered to win ***3*** sets of Relics & Artifacts® Matte Resin craft blanks of your choosing! Be sure to visit the That's Crafty! blog and see the beautiful project Carol Fox has in store for you today! That's Crafty! MDF Upright "Decorative Top"
That's Crafty! Dinky Stencil "Floral Background"
Since you already know our Christmas here in Puerto Rico lasts long into the New Year, I thought I would share this tree with you. If you take a closer look at the presents underneath the tree, you'll see they are all David Yurman bags. Yes, David Yurman, the jeweler! Don't I wish they were all for me, but an even closer look would reveal this: Relics & Artifacts® ornaments!!!! I made *50* of these beautiful chandelier pendant ornaments for this display. My eternal thanks to David for rushing them out to me! It was actually good to go back and read my last post of 2015 and all the hope I had for 2016. As the new year approaches, I bid you creativity, opportunities and wings, as I feel that on angel wings we soar! That song positevely makes me happy, it's one of my faves every coming Christmas. I love making ornaments, decorating my home, and baking. I think my theme this year is trending towards gold Dresden, a definite fetish there as in my eyes Dresdens dress elegantly anything it touches! I also like the fact that just by looking at them I can find unusual shapes or uses for them! I'm listening to Tchaikovsky as I write. The Nutcraker Suite at full blast and my Christmas in full mode. Christmas is my favorite time of the year! 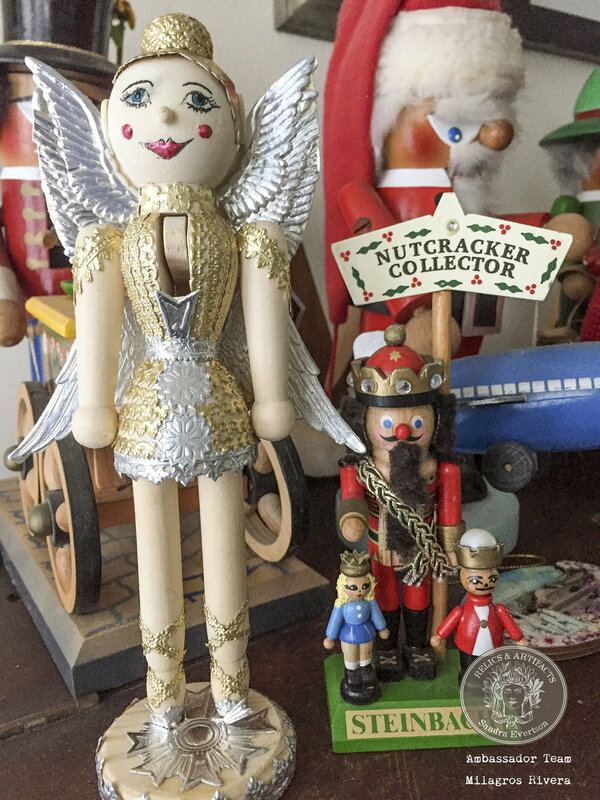 I started collecting nutcrackers some 20 years ago when my son was born. My first Cassiopeia's Throne was an adorable piece named Christmas Morning, I played with Apoxie sculpt to give you the feel of expensive fabric, a velvet throw and 2 sweet presents on top! So my best friend says: Christmas? You seriously skipped Halloween this year? There's a mystique in faith and worship. A history that may or may not touch you but it's palpable in every culture. Don't Overthink! Whenever you're creating that's a good mantra! How many times have you gone over the top to regret it because you were overthinking? Or how many times did you not dare take a chance because you just thought it too much? Inspiration, it just hits you. It has a way of sneaking up on me in the middle of the night, during a conference, on a trip, whenever I'm quietly driving, I just never know, do you? I grew up and still live on an island, surrounded by water that changes to different shades depending on depth, reefs or sand. The piece I bring you today is inspired by that, my precious Caribbean Sea.